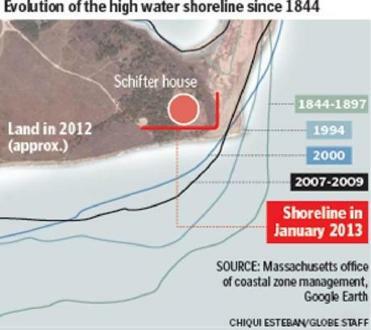 Scouring seas were closing in on a Chappaquiddick manse. The owner is now moving it all — but to what end? CHAPPAQUIDDICK — The house was denounced even before it was built: an 8,300-square-foot mansion with seven bathrooms and a bowling alley in the basement, rising on a fragile cliff above the ocean. To many island residents it was a violation, eternally defiling their beloved rural landscape. Or maybe not so eternally. 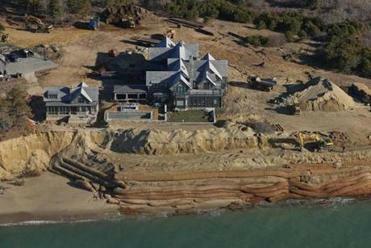 Six years after Washington, D.C., private equity firm partner Richard Schifter and his wife, Jennifer, finished building their summer retreat, the cliff where it sits is crumbling into the sea at a rate sometimes surpassing a foot a day. Erosion of the bluff, on Wasque Point at the southern tip of Chappaquiddick, accelerated after April 2007, when a fierce nor’easter punched a hole through the barrier beach at nearby Norton Point, changing how the ocean moves around the island. Now that the distance between their swimming pool and the edge of the bluff has dwindled from 220 feet to a mere 40, the Schifters have launched an urgent quest to save their property by moving it — all of it, including the gray-shingled, 1,200-ton main house and surrounding guest house, pool and terrace, garage and landscaping — back from the cliff. The gambit, which locals guess will cost millions, has become a closely watched saga on Martha’s Vineyard, drawing scrutiny from neighbors and local officials. The Schifters plan to move their buildings back from the shore in a never-ending battle with erosion. Coming in the midst of national debate about the sustainability of coastal communities, in the wake of Hurricane Sandy and a series of ferocious winter storms, the dilemma faced by one family in a quiet corner of the Vineyard has forced islanders to confront hard questions: about the force of nature and the changing climate, the limits of human resistance, and the shape their evolving island will take in the future. Undercurrents of amazement run through the debate — at the stunning speed of the erosion underway, which has dissolved about 200 feet of land in the past year, and at the audacity of the gamble being waged. If the Schifters and their engineers have miscalculated, and the ocean continues to eat away their land at the same pace, their plan to move the house back 275 feet will not be enough to save it for long. Erosion is not new to the Vineyard, or to Chappaquiddick, the 6-square-mile island east of Edgartown, reached by a tiny ferry, where fewer than 200 people live year-round. For centuries, residents and scientists have documented changes in the size and shape of the island, including periods of dramatic transformation as well as less dynamic intervals. Surveys dating to the 1700s show previous breaches in the Norton Point barrier beach, breaks which eventually closed as the shifting ocean currents slowly restored sand deposits. If the general pattern is familiar, though, the situation now unfolding at Wasque (pronounced “way-skwee”) Point has generated sharply differing opinions — on how soon the breach might close, slowing the erosion; on the role of climate change and rising sea levels in what is happening; and on how much leeway should be granted to homeowners who build in an environment known to be in flux. Some observers call the recent pace of erosion unprecedented and unforeseeable. Hundreds of feet of sandy beach have vanished since the 2007 breach, in addition to the more recent collapse of the bluff itself. Others say the rapid changes are not so surprising, and that the Schifters’ plight might have been avoided if those who built the house had minded the lessons of history. As climate change causes glaciers to melt and warming oceans to expand, Massachusetts is particularly vulnerable. Sea levels here are rising three to four times faster than the global average, according to a 2012 US Geological Survey report. That means when storms hit — even low-intensity storms — flooding and erosion could be intensified. Some Vineyard towns have started to make tough decisions. In Chilmark earlier this year, officials denied a request to move a modest summer house teetering on the edge of an eroding cliff, saying the structure’s relocation would simply be postponing the inevitable. The house, above Stonewall Beach, was ordered torn down instead. In an interview, Richard Schifter said his quandary offered no easy solution. The Schifters are not the only property owners in trouble on Wasque Point, though their predicament — and aggressive, expensive response to it — has attracted the most attention. A smaller, 30-year-old house nearby, owned by a Lexington couple, is also threatened by the fast- advancing ocean. The homeowner, Jerry Wacks, expressed sadness at the Schifters’ plight and said he has been troubled by the “downright mean” tone taken by some critics. He did not respond when asked what he plans to do about the threat to his own house. Edgartown officials say it would be difficult to deny the Schifters the right to move their house, regardless of how fruitless the effort might turn out to be. “It’s Mr. Schifter’s money,” said Vincent, the Conservation Commission chairman. Still, some islanders have criticized the commission for its decision, saying members’ first responsibility is to protect the fragile bluff from damage. They fear massive digging at the site could permanently scar it or leave it even more vulnerable to erosion — with no guarantee that the upheaval will save the house. Addressing concerns that the cliff might keep receding to the house’s new location, Peter Rosen, a coastal geologist hired by the Schifters to assess the erosion, called the past winter “a very, very rare circumstance of storm after storm” and predicted the rate of erosion will slow to a more normal six to nine feet per year. But even Richard Schifter acknowledged the risk that it might not. Increasingly, local officials are dealing with the uncertainties. Elsewhere on the Vineyard, in Aquinnah, the iconic Gay Head lighthouse is also threatened by erosion and in urgent need of relocation. More than half the permit requests now before Edgartown’s Conservation Commission are from residents hoping to address the effects of erosion, said Vincent, the chairman. Vincent, whose family has lived on the Vineyard for more than three centuries, said changing attitudes are part of the equation. “Very few old-timers would build anything that close to the ocean,” he said. On Chappaquiddick, known locally as “Chappy,” the prevailing ethos was long steeped in old-fashioned Yankee restraint. Houses here tended to be modest and hard to see, tucked in among dirt roads and acres of wild scrub oaks. Residents, who gather twice a month for potluck suppers at the shingled community center, are fiercely protective of the island’s rural character; some have even pitched in to buy houses on the island for the purpose of demolishing them, creating more open space and unobstructed views. But many others are simply incredulous. “The word I hear is ‘crazy’,” said Becker, a longtime island resident who objected to the size of the Schifters’ house when it was built, and was motivated by its construction to run for the Planning Board, where he served five years. The project has raised concerns about traffic on the quiet island — hundreds of truck trips will be required to ferry in heavy equipment and carry out debris — and the environmental impact on Wasque Point. Crews moving the house will dig a giant trench around the foundation — 450 feet long, 20 feet deep, and within 30 feet of the cliff’s edge — so that the entire basement (bowling alley and movie theater included) can be lifted on steel beams and rolled on dollies with the house to its new location. The New York company handling the move has previously relocated numerous lighthouses (including, in 2007, a Nantucket lighthouse threatened by erosion), a Minneapolis theater, and a Newark airport terminal that weighed more than 7,000 tons, according to its website. The scale of the four-month Chappaquiddick project has attracted the attention of the Vineyard’s Wampanoag tribe, which wants to protect any tribal artifacts potentially in the house’s path, as well as the Trustees of Reservations, the nonprofit conservation group that owns the pristine beachfront preserve next to the Schifters. Recent erosion has swallowed much of the 200-acre property, including a parking lot, stairs and boardwalks; the wide expanse of white sand beach, open to the public, has narrowed to a strip beneath the cliffs. Despite the local concerns, Schifter said his family has felt buoyed by waves of support. On a windy day late last month, the rumble of heavy equipment on his land drowned out the waves crashing just below. A yellow excavator perched on the edge of the bluff dumped clawfuls of soft yellow sand over the edge, to a ridge lower down where three workmen shoveled it into massive sandbags. The log-shaped bags, made of coconut fiber, were piled like beached whales at the water’s edge, a time-buying bulwark that has slowed the Atlantic’s advance. Becker and others who live nearby walk the point daily to monitor the changes, mesmerized by the spectacle of transformation — and the suspense of an uncertain ending. He says he could not have fully grasped the raw power of the forces reshaping the island, their jaw-dropping efficiency, without witnessing the recent changes. Beth Daley of the Globe staff contributed to this report. Jenna Russell can be reached at jrussell@globe.com.